Art of Brooklyn Film Fest 2017: Exclusive FUTURE '38 Clip - Watch Those Hands! Ahead of its New York Premiere at the Art of Brooklyn Film Festival this coming Thursday, June 8, we have an exclusive clip from Future '38. Our modern world through a 1930's lens. 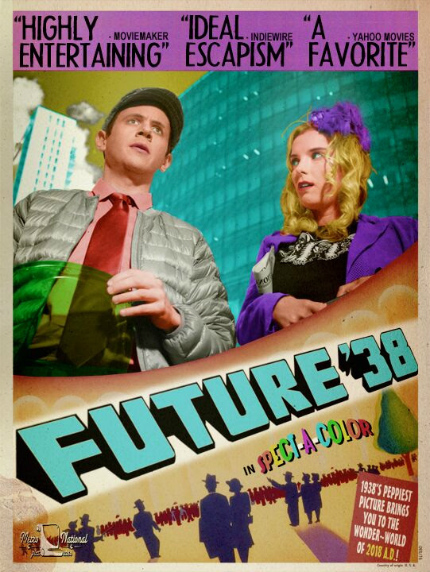 Future '38 is a "lost" classic film from 1938. Filmed in blazing early Technicolor, it's the story of a man who must save the world by traveling to the year 2018. Jamie Greenberg wrote and directed. The cast includes Betty Gilpin, Nick Westrate, Robert John Burke, Ethan Phillips, Sean Young, Tom Riis Farrell, Sophie von Haselberg, Tabitha Holbert and Ilana Becker. More information is available at the official festival site. -Gals Are Like Teeter-Totters- from K2 Publicity on Vimeo.